Netflix has unleashed a stinging first look at Narcos Season 4, which is titled Mexico. Two new leading men emerge to take over the high-powered drama that has been a massive hit for the past couple of years running. And it looks like we're in for another blistering set of episodes. This tantalizing first look features Michael Peña and Diego Luna in Narcos: Mexico. The addictive drama continues to follow the drugs and the money as it moves into new territory, launching as a new original series on Netflix this year. Narcos: Mexico will launch as its own original series in 2018. The action is shifting away from Colombia, where Narcos spent three seasons, Narcos: Mexico will explore the origins of the modern drug war by going back to its roots, beginning at a time when the Mexican trafficking world was a loose and disorganized confederation of independent growers and dealers. Narcos: Mexico is produced by Gaumont Television for Netflix. Eric Newman is Executive Producer and showrunner. José Padilha, Doug Miro and Carlo Bernard are Executive Producers. Michael Peña will play Kiki Camarena, a family man and an undercover DEA agent who garnered valuable intel through a series of informants around Félix and his newly minted Guadalajara cartel, but quickly found himself in c as he realized he had completely underestimated the sophistication of Gallardo's system. 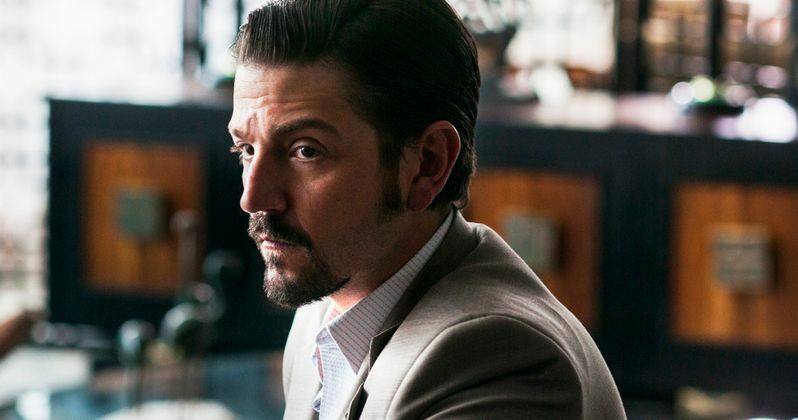 Diego Luna will play Miguel Ángel Félix Gallardo ("Félix"), the leader of the Guadalajara cartel, one of the biggest narcos in the history of Mexico and the founder of the modern Mexican drug trade. Quiet but bold, inscrutable but sharp-minded, to all appearances he is a benevolent leader, loyal to his friends, associates, and employees...but his ambition comes before all else. Additional casting for the series includes: Aaron Staton (Mad Men) as Butch Sears, Alejandro Edda (Fear the Walking Dead) as Joaquin "Chapo" Guzman, Alfonso Dosal (Hazlo como hombre) as Benjamin Arellano Felix, Alyssa Diaz (Ray Donovan, The Rookie) as Mika Camarena, Clark Freeman (We Go On) as Ed Heath, Ernesto Alterio (Cable Girls) as Salvador Osuna Nava, Fermín Martinez (Lady of Steel) as Juan Jose Esparragoza Moreno ("El Azul"), Fernanda Urrejola (Bala Loca) as Maria Elvira, Gerardo Taracena (Apocalypto) as Pablo Acosta, Gorka Lasaosa (Brain Drain) as Hector Palma, Guillermo Villegas (Sin Nombre) as Sammy Alvarez, Horacio Garcia Rojas (Texas Rising) as Tomas Morlet, Jackie Earle Haley (Watchmen, Little Children) as Jim Ferguson, Joaquín Cosío (Quantum of Solace) as Don Neto (Ernesto-Fonseca Carillo), José María Yazpik (Narcos) reprises his role as Amado Carrillo Fuentes, Lenny Jacobson (Nurse Jackie) as Roger Knapp, Manuel Masalva (Mi corazón es tuyo) as Ramon Arellano Felix, Matt Letscher (Scandal, The Flash) as James Kuykendall, Tenoch Huerta (Sin Nombre) as Rafael Caro Quintero, Teresa Ruiz (Here on Earth) as Isabella Bautista, Tessa Ia (The Burning Plain) as Sofia Conesa, Yul Vazquez (The Looming Tower, Magic City) as John Gavin. Narcos: Mexico will premiere globally on Netflix in 2018. We kindly request that you link to www.netflix.com/narcosmexico in your coverage.